“A cake, Frank, is made of flour and water.” If George Banks–America’s most famous father of the bride–was shocked at the prices of wedding cake in 1990’s, just imagine what he’d think of our Pinterest-driven, reality-TV competing wedding planning of today. 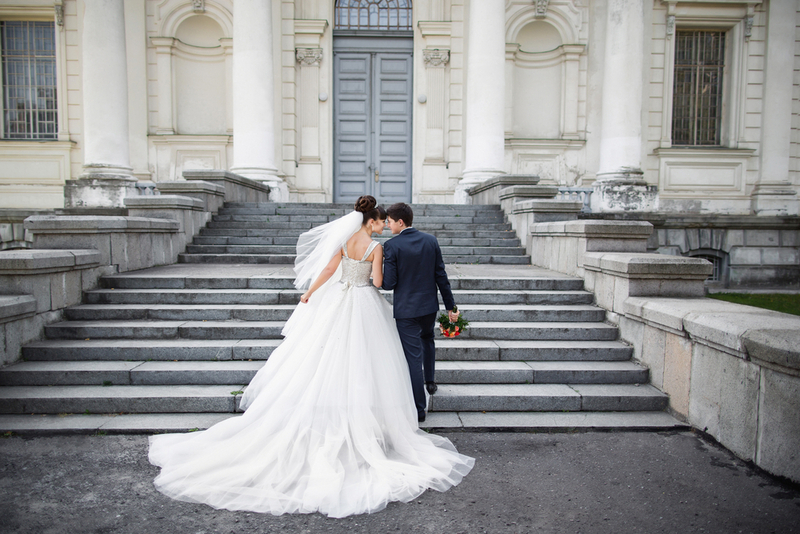 For some brides and grooms, planning a wedding is a dream come true. And yet for many, the price tags can quickly turn that dream into a nightmare. Here are ten bankable tricks for throwing a once-in-a-lifetime party without a once-in-a-lifetime budget. From venues to catering to entertainment, timing is everything. And most popular wedding-related service businesses know they can book their Saturdays without issue. As a result, everyone’s favorite weekend night goes for top dollar. But consider a Friday wedding, or dare we say it, a Thursday wedding, and you’re likely to be met with plummeting prices. Some venues will appear to be available for a steal. But if they force you to use their catering services, you may discover that the savings were just a mirage. Venue catering services can charge as much as $50 per head for something as simple as a glass of wine and slice of cake for each guest. Instead, find an affordable venue that also lets you use any caterer you’d like. Speaking of cake, this is where the insanity of wedding pricing gets its reputation. Purchase a gorgeous cake for any other event, and you could be out $100+. Purchase a wedding cake, and you could spend thousands. Our tip? Create a stunt double cake out of styrofoam and fondant, then serve slices cut from a more affordable sheet cake. Here’s a quiz: what features manicured landscaping and an abundance of multi-purpose spaces? Answer: universities! If you’re lucky enough to live near a college, ask for their venue rental prices. Some may even offer high-end catering services at dining hall prices. Or take your love to court. Not in the college mood? How does court sound? To win the budget wars once and for all, have a judge officiate a courthouse wedding for nothing but the cost of licensing. Seek out an attractive venue. Decor can drain your entire wedding budget while you’re not even looking. Your best bet is to seek out a venue that already provides plenty of visual interest. Places like museums and old state capitol buildings often need nothing but a group of happy guests to be transformed into a gorgeous ceremony. Twenty years ago, sourcing your own flowers would have required knowing someone in the industry. Today, there’s something called the internet. And wholesale floral prices–and order processes–are becoming available to us all. Floral supply sites like FiftyFlowers.com offer bulk buds at bargain prices. That aunt who’s been begging to help with something? Get ready to delegate. Or, ditch the bouquets all together. Oversized balloons, clutches, or a single perfect flower each give your best girls something to hold without the sticker shock of freshcut bouquets. What would you say if someone told you you had $10,000 to plan a party? How about $20,000? $30,000? You’d likely envision the most elaborate party your city has ever seen. But if they clarified it was a wedding, you may have second thoughts. Well, so do vendors. Weddings are the ultimate money makers for florists, photographers, and venues alike. Whatever you do, avoid using the word until you absolutely have to. So what are you looking for? Oh, just a white dress.